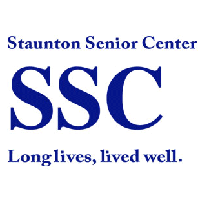 Many members turned out to enjoy the festivities at Staunton Senior Center on Sept. 26, which was September Birthday Celebration Day as well as Red Hat Day with the signature red and purple adorning most members and staff. Carol Byrd from the YMCA led exercise, incorporating the Hokey Pokey twice, which was a lot of fun. For the non-exercisers, card games and dominoes were in full swing, and then there was the health program by Shelly Lam of Kings Daughters Health and Rehabilitation Center entitled “Staying Healthy Over 50: How to Feel Young and Live Life to the Fullest”. One of the newest Center members won the Red Hat Day drawing, a wonderful three in one prize of gift bag, vase, and skin cream. Birthday cake was part of the celebration of course, with a rendition of Happy Birthday sung to the two birthday girls led by High on the Mountain Boys, the post-lunch entertainment. All in all it was a great day to be at SSC!